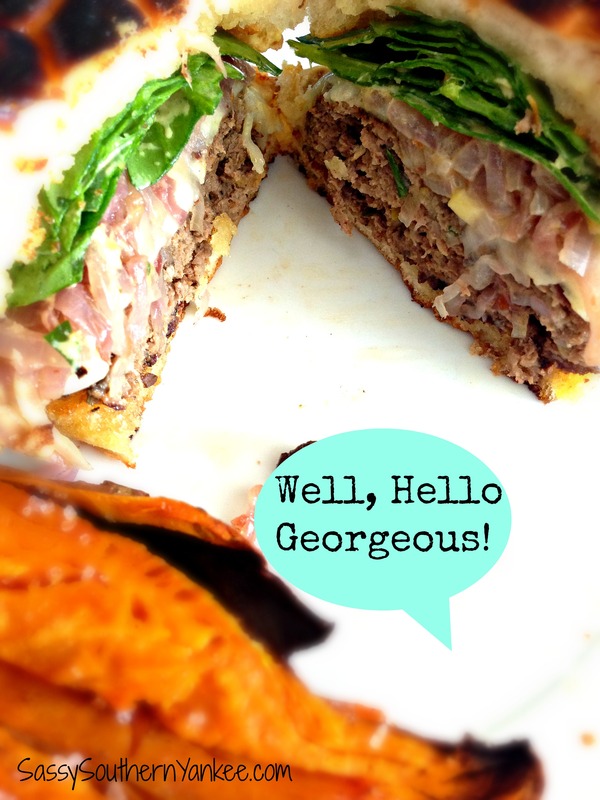 Looking for a way to lighten up your go to burger recipe? This baby bella mushroom burger recipe will knock your socks off. It’s a great way to save money, increase flavor and keep your burgers moist. By adding the baby bella’s you use less beef which is cost-effective and better for your waistline! Have someone in your life that isn’t a mushroom lover? No problem they will never know that mushrooms are in the dish and I won’t tell unless you do! It’s a great way to sneak veggies into your kids diet. To get things started wash and drain the mushrooms; roughly chop the mushrooms. Add the mushrooms with the olive oil to a skillet over medium heat; cook until they just start to caramelize. I love to wait until my local grocer has mushrooms 10 for $10 and stock up. Remove the mushrooms from the heat and add 1/2 cup of red wine to deglaze the pan (if you don’t want wine you can do the same thing with a bit of water). Allow the mushrooms to cool for a few moments. 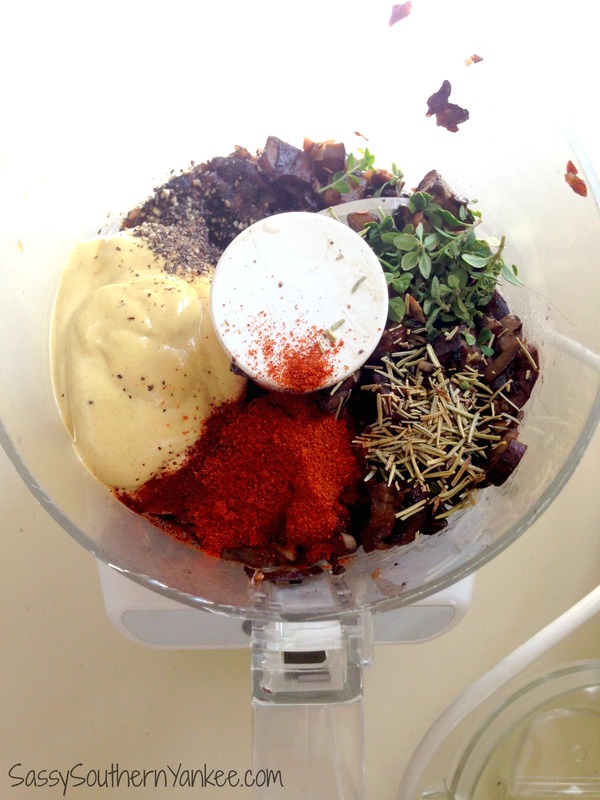 Once the mushrooms are cooled pop them into the food processor and add the garlic, Dijon mustard, rosemary, Worcestershire Sauce, smoked paprika and chili powder. Pause the mixture until combined and the mushrooms are almost like a paste. In a large bowl add the ground beef; then add the mushroom mixture. Using your hands mush, yes I said mush together the mixture to thoroughly combine the beef with the mushrooms. Once combined divide the mixture into 8 even portions (I used a 1/2 cup measuring cup). Shape each portion into a hamburger patty and place on a platter. Once all of your patties are made cover with plastic wrap and allow to sit in the fridge overnight. This allows all those delicious flavors to blend together. Please note that the mushroom burgers will be brown in color due to the mushrooms and the Worcestershire Sauce. When you are ready to cook fire up the grill or if you live in the arctic tundra in the great north and it’s too early to roll out the BBQ a great cast iron skillet works wonders, or your ovens broiler. Heat over high heat cooking for about 3-4 min per side. Add a slice of swiss and allow it to melt onto the burger. Remove from the heat and allow the burgers to sit for a moment so the juices can redistribute. I love to eat these mushroom burgers with a bit of caramelized red wine shallots, a bit of Dijon mustard and some fresh baby spinach on a Gluten Free Bun. *To whip up a batch of our famous Red Wine Caramelized Shallots you will need the following 6 Shallots sliced thin, a teaspoon butter and 1/4 Cup Red Wine. Slice the shallots as thin as possible heat with the butter over low heat until soft and translucent. Raise the heat a bit to encourage caramelization. Once the shallots are caramelized remove from the heat and stir in the red wine. Return back to the heat to cook off any alcohol. Looking for a way to lighten up your go to burger recipe? 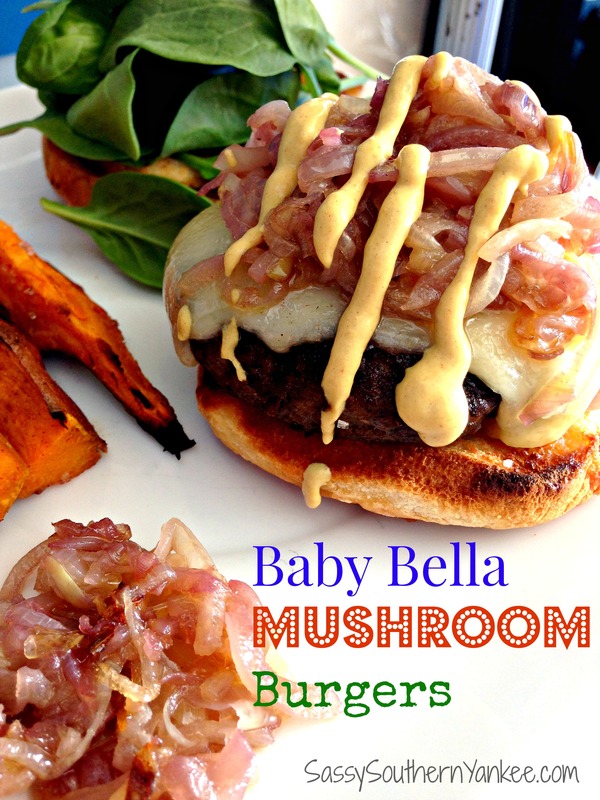 These baby bella mushroom burgers will knock your socks off. Remove the mushrooms from the heat and add ½ cup of red wine to deglaze the pan (if you don't want wine you can do the same thing with a bit of water). Allow the mushrooms to cool for a few moments. In a large bowl add the ground beef; then add the mushroom mixture. Using your hands mush, yes I said mush together the mixture to thoroughly combine the beef with the mushrooms. Once combined divide the mixture into 8 even portions (I used a ½ cup measuring cup). Shape each portion into a hamburger patty and place on a platter. When you are ready to cook fire up the grill or if you live in the arctic tundra in the great north and it's too early to roll out the BBQ a great cast iron skillet works wonders, or your ovens broiler. Heat over high heat cooking for about 3-4 min per side. Add a slice of swiss and allow it to melt onto the burger. 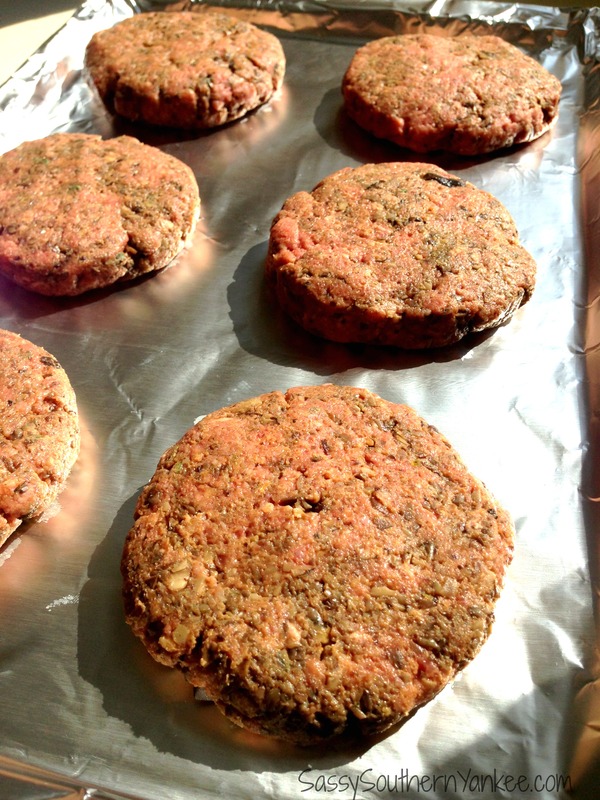 Remove from the heat and allow the burgers to sit for a moment so the juices can redistribute. 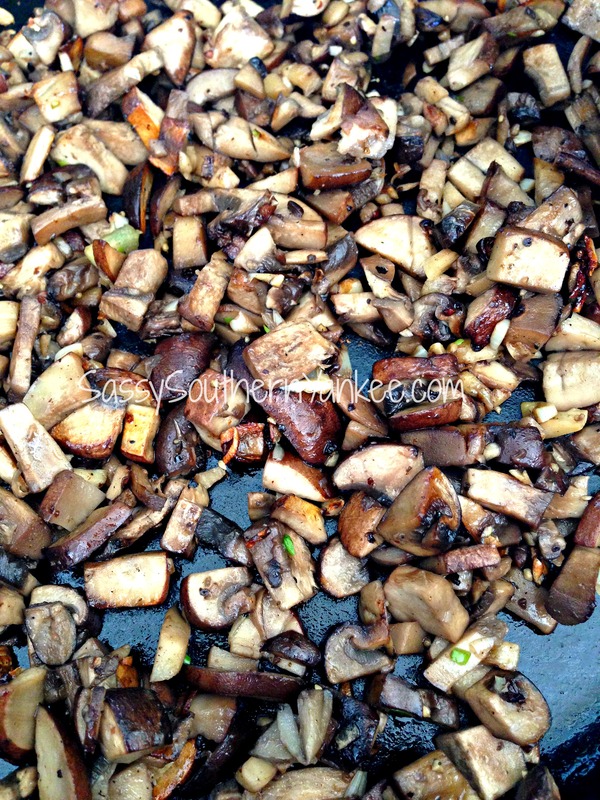 This entry was posted in Main Course and tagged Baby Bella Mushroom, Burgers, Clean Eating, Cooking on the BBQ, Hamburger, Low Carb, Mushroom, Portobello Mushrooms, Red Wine, Shallots, Swiss Cheese.